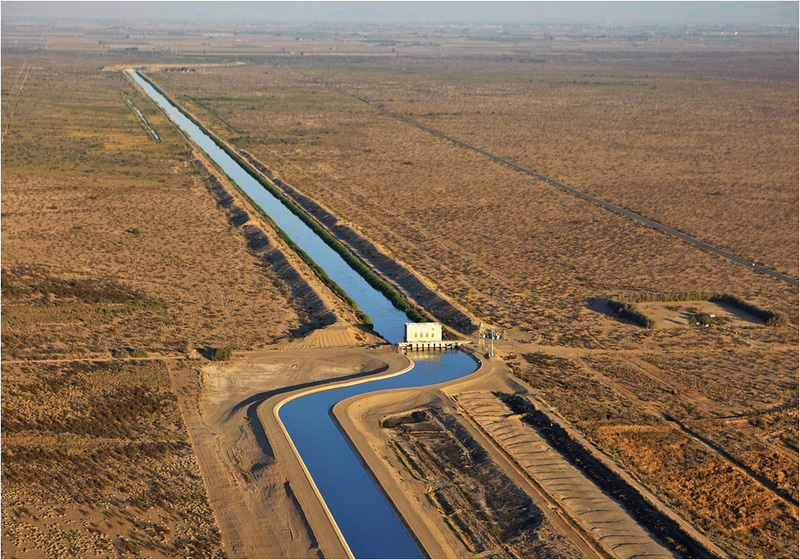 The All-American Canal, the main water conduit from the Colorado River into the Imperial Dam, flows through the Imperial Valley, Calif. The U.S. consumes about 100 billion gallons of water a day. Nearly 85 percent is used for crop and livestock production. Of the 16.1 billion gallons that remain, half is devoted to producing energy. In November 2009, in pursuit of a cleaner energy development strategy that also reduced carbon and other climate changing gases, Interior Secretary Ken Salazar announced that his agency had identified 23 million acres of public lands in six southwestern states as prime locations for new solar electrical generating plants. Salazar also said that the Bureau of Land Management, an Interior Department unit that owns and oversees much of the western public domain, was encouraging new solar plant construction with a “fast track” permitting process. The process would make some plants eligible for federal grants and loans under the 2009 American Recovery and Reinvestment Act, which included nearly $100 billion for clean energy investment. The dual announcement was anticipated by executives in the solar generating industry, who responded with an avalanche of applications to federal and state agencies to build more than 180 new solar plants in California, Nevada and Arizona. But senior leaders of other Interior Department units, most notably the U.S. National Park Service, also responded to the agency’s promotion of solar energy with unusually sharp critiques of the potential consequences to the Southwest’s natural resources, especially the region’s scarce water supplies. Solar generating plants that use conventional cooling technology use two to three times as much water as coal-fired power plants, according to the U.S. Department of Energy’s National Renewable Energy Laboratory. Newer technology that relies on air for cooling uses much less water, but also is less efficient in generating power, thus requiring more land. The Congressional Research Service recently estimated that solar power plants cooled with water could generate 53,000 megawatts of electricity in the Southwest, equal to more than 50 large coal-fired utilities, but also would require 164 billion gallons of water annually, an enormous amount in the driest region in the country. In February 2009, Jon Jarvis, then the head of the Park Service’s Pacific West Region, and now the Park Service director, took the unusual step of warning his Interior Department colleagues that a solar construction boom in the desert, which results in dozens of conventional wet-cooled solar plants, could tilt the already fierce competition for water in the Southwest the wrong way. “In arid settings, the increased water demand from concentrating solar energy systems employing water-cooled technology could strain limited water resources already under development pressure from urbanization, irrigation expansion, commercial interests and mining,” Jarvis wrote in the internal memorandum. In almost every way imaginable, Jarvis’ warning is emblematic of the critical choke points emerging in the United States as rising demand for new sources of energy confronts the nation’s diminishing supplies of fresh water. Four months ago, in Choke Point: U.S., Circle of Blue set out to better understand what was happening around the country as communities, businesses, and residents confronted the increasingly intense competition between water and energy. Our reporting from the coal fields of southern Virginia, the high plains of the Dakotas, California’s Central Valley, the Midwest’s farm fields, Northern Alberta, Canada, and elsewhere identified urgent contests between energy development and water supply that can be resolved. But taming the conflict between energy and water also poses extraordinarily difficult challenges to regional economies, governing practices, technological development and the quality of natural resources. Most importantly, though, Choke Point: U.S. raises significant concerns about the values and principles that form the basic foundation of national energy policy in the era of rapid population growth, rising energy demand and climate change. The DOE has prepared a number of studies, accepted largely without question, that predict that as the nation’s population reaches more than 440 million in 2050, energy demand will increase by 40 percent. Federal authorities, along with technical specialists in private industry and academia, insist that such demand can be met by producing more energy sources from fossil fuels and nuclear power, and by developing cleaner energy sources such as wind, solar, geothermal, biofuels and wave energy, which also have the benefit of reducing emissions of carbon dioxide that are warming the climate. ROCHELLE, ILLINOIS, AUGUST 2010: The Illinois River Energy biofuels plant in Rochelle releases plumes of steam at sunrise. 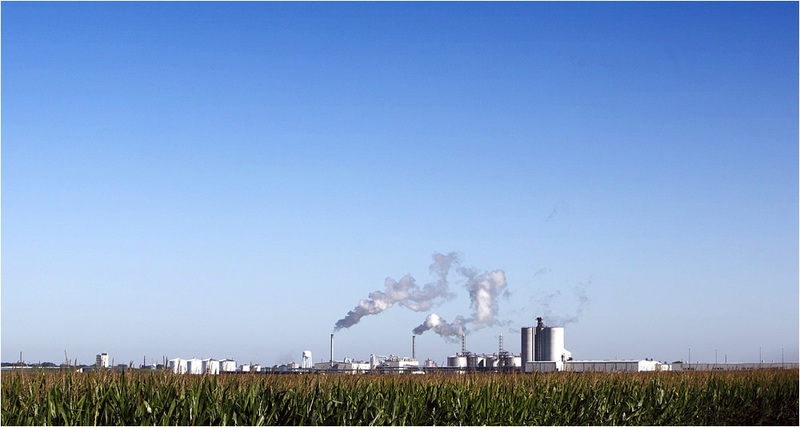 The ethanol plant processes over 40 million bushels of corn into 115 million gallons of fuel grade ethanol annually. The plant is one of hundreds around the country transforming corn into ethanol. It takes nearly 1,000 gallons of water to produce a gallon of ethanol from irrigated corn: four gallons from unirrigated corn. Underlying the nation’s strategy is the principle that the nation can meet its rising energy demands by applying technology and characteristic American innovation to the job of generating more energy. But in Choke Point: U.S., Circle of Blue found that without significant changes in approach, meeting the demand for 40 percent more energy by mid-century –if it’s even possible – will come at an extraordinary price to the nation’s air, water, land and quality of life. Rising energy demand and diminishing fresh water reserves are two trends in dramatic collision across the country. Moreover, the speed and force of the collision is occurring in the places where growth is highest and water resources are under the most stress: California, the Southwest, the Rocky Mountain West and the Southeast. Indeed, Choke Point: U.S. found that while federal energy experts, and their colleagues in academia and industry pursue an energy development strategy strongly devoted to more production, they are not paying sufficient attention to addressing the water supply, the primary impediment. Scientists define water consumption by two basic measurements. One is how much water is withdrawn from America’s rivers, lakes and aquifers for domestic, farm, business and industrial use, most of which is returned to those same sources. The second is how much water is actually consumed in products, by livestock, plants and people, or evaporates in industrial processes. In both measurements of withdrawal and consumption, energy is at the top of the charts. The United States withdraws 410 billion gallons of water a day from its rivers, lakes, aquifers and the sea. About half is used to cool thermoelectric power plants, and most of that is used to cool coal-powered plants, according to the most recent assessment by the United States Geological Survey (USGS). Similarly, the country consumes about 100 billion gallons of water a day. Nearly 85 percent is used for crop and livestock production. Of the 16.1 billion gallons that remain, half is devoted to producing energy. Graphic created by Ball State University graduate student, Daniel Cooper. In just three years, North Dakota has established itself as the number four oil producing state in the nation—but at what cost to its water supply? Federal and state regulators, and even coal industry executives grudgingy acknowledge the ropes of ecology, economy and efficiency that are tightening around the nation’s energy sector. Climate change is leading to decreased supplies of rain, snowmelt and fresh water. But as the contest between energy and water grows steadily more fierce, the United States seems intent on bypassing the conflict. In one of the most startling findings of Choke Point: U.S., Circle of Blue reporters discovered that a far-reaching federal program of research and analysis, funded by Congress and designed to help the nation anticipate and temper the mounting conflict between rising energy demand and diminishing supplies of fresh water, has been brought to a standstill by the DOE. The research program, known as the National Energy-Water Roadmap and ordered up by Congress as part of the 2005 Energy Security Act, was meant to provide lawmakers and the executive branch two studies of the impending conflict between energy and water. The program also explains what to do about the collision. The first, completed by a team of federal scientists in December 2006 and made public a month later, described the serious consequences the nation is already encountering, as the United States encourages more energy production, which is the second largest water-using sector, but gives scant consideration to water supplies, which are in retreat in most regions of the country. Meanwhile, the second and final report that Congress commissioned—a comprehensive research agenda to better understand the nation’s energy—water choke points and begin developing real world solutions – has been held out of public view for more than four years. The DOE declined repeated requests for interviews about the reasons for keeping the report from publication. 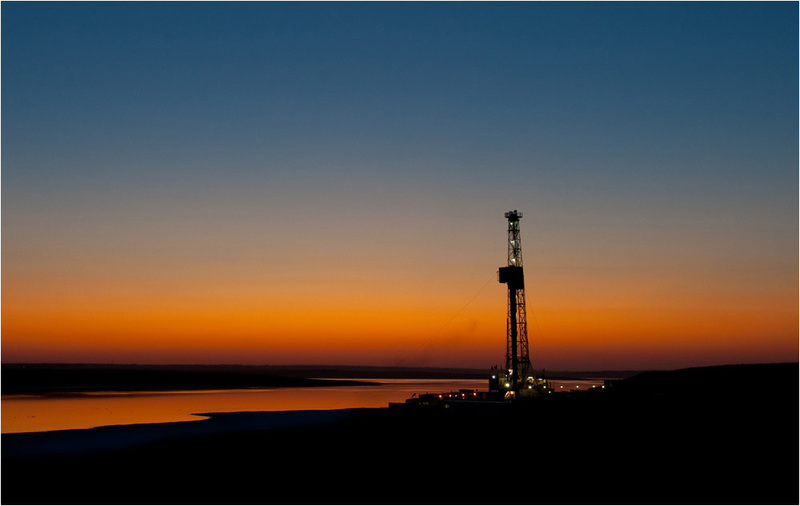 STANLEY, NORTH DAKOTA, SEPTEMBER 2009: An oil drilling rig on the Bakken Shale formation at sunset. Unless the United States plans more carefully, generating energy from clean alternatives is almost certain to consume much more water than the fossil fuels they are meant to replace. Generating one gallon of fuel from irrigated corn, for instance, takes 650 gallons of water. Generating one gallon of gas from oil takes one gallon. Solar thermal power that is conventionally cooled consumes more water than a coal-fired and nuclear-powered plant. Of all the available green energy technologies, only wind and solar photovoltaics consume less water than fossil-fueled energy. Geothermal can save water or consume more depending on the technology used and the location. The region that is confronting the energy water choke point first and most dramatically is the Southwest, as climate change steadily diminishes snowmelt in the Rocky Mountains. The Colorado River transports less water than it did a decade ago. Lake Mead, which stores water from the Colorado River and is one of the largest reservoirs in the country, is 41 percent full. The lake’s water level has fallen 135 feet since it was last full in 1999. Declining water levels have prompted federal managers to reduce the Hoover Dam’s hydroelectric generating capacity 33 percent. Federal authorities say if the lake falls 25 more feet, the dam’s generators will be pushed to operate beyond their designed capacity, threatening to shut down one of the largest power plants in the West. The next era of hydrocarbon development is well underway in the United States as energy companies tap the “unconventional” oil sands of Canada, the oil shales of the northern Great Plains, and the gas shales of the Northeast, Texas, Oklahoma and the Upper Midwest. But tapping each of these carbon-rich reserves is producing more damage to the land, generating more carbon emissions, and using three to four times as much water than the conventional oil and gas reserves they are replacing. Essentially, the energy industry is becoming a mining industry, turning carbon-rich sands into fuel and using water shot into the ground under super high pressure to shatter deep shales to release oil and gas. The scale of the industrial enterprise is immense and moving with amazing speed. In tar sands production alone, oil companies and pipeline developers are spending $15 billion to develop the tar sands; $30 billion to build a new network of pipelines from Canada to U.S. refineries (including one that has produced a dispute between state and the EPA), $20 billion to modernize refineries in the Great Lakes, Illinois, Oklahoma and the Texas Gulf. Earlier this year, Exxon Mobil paid $41 billion for XTO Energy, which has big reserves in tar sands, deep gas shale and oil shales in the United States. Developers in North Dakota are spending roughly $7 billion annually to drill 1,000 wells a year now into the Bakken Shale formation and are reaping a bonanza—100 million barrels of oil and 100 billion cubic feet of gas this year. The state is the nation’s fourth largest producer of oil now, behind Texas, Alaska and California. Three years ago, it was barely in the top ten. And the industry also is using billions of gallons of North Dakota’s scarce groundwater to fracture the shale, and generating a civic pushback from farmers and rural residents concerned about the supply of groundwater. The source of more than half of the natural gas produced in the United States is deep shale reserves underlying the Northeast, Gulf Coast states, the West and Midwest. But each of the thousands of wells drilled each year into the unconventional gas shales requires three million to six million gallons of water injected under high pressure to fracture the rock and enable gas to flow out of the rock. Accidents involving so called “fracking” have caused contamination and interruptions in water supply in Wyoming, Pennsylvania, Colorado and other states. The U.S. Environmental Protection Agency is studying the safety of the practice. The political influence of the energy industry has no equal in the U.S. In Kern County, Calif., where the agriculture industry and the oil industry compete for diminished supplies of water for irrigation and energy production, the big winner is the oil industry. While a severe drought wracked the state, and agricultural and environmental groups wrangled over sharply reduced water shipments to irrigate the arid San Joaquin Valley, the oil industry received 8.4 billion gallons a year—as much water as it needed—from the web of aqueducts and canals that carry water from rivers and reservoirs high in the Sierra Nevada. The energy vector in the United States points strongly to more fossil fuel consumption, not less. That means much more climate changing emissions and tighter fresh water reserves. For instance, the utility industry has opened or begun construction on 32 new coal-fired plants since 2008, according to the DOE. Those plants represent 17.9 gigawatts of new energy and 125 million more tons of carbon dioxide each year. They also represent the sharpest increase in coal-fired power in a generation and will consume billions of gallons of water a year. Unconventional tar sands and shale oil reserves in the country (North Dakota, Montana, Utah, Wyoming, Colorado) contain two trillion barrels of oil—enough to supply America at the current level of demand (7 billion barrels a year) for hundreds of years. The deep gas-bearing shales contain millions of trillions of cubic feet of gas—also enough to supply the country for centuries. Carbon capture and storage technology, which is the favored tool to reduce carbon emissions from fossil-fueled electric generating plants, is undergoing a handful of tests, including at a new electric-generating plant just permitted and partially financed by the DOE in arid Kern County. But the technology also increases water consumption at coal-fired utilities 40 percent to 90 percent, according to the DOE. These findings, the first in a multi-media reporting project that Circle of Blue intends to pursue for the remainder of this year and through the next, represent a new way to look at the economically essential and ecologically damaging accord between energy and water. Choke Point: U.S. is among the first comprehensive assessments that bring that conflict into sharp national focus. It is not just that energy production could not occur without using vast amounts of water. It’s also that it’s occurring in the era of climate change, population growth and steadily increasing demand for energy. The result is that the competition for water at every stage of the mining, processing, production, shipping and use of energy is growing more fierce, more complex and much more difficult to resolve. Energy production withdraws and consumes more fresh water than any industrial sector other than agriculture. With the exception of wind power and solar photovoltaics, all of the clean energy resources available to the United States use more water than producing energy from conventional fossil fuel and nuclear energy.